Loba - thanoscardgamess jimdo page! 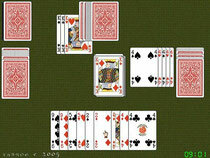 Piernas: A pierna consists of three cards of the same rank from different suits. Escaleras: An escalera consists of four or more cards of the same suit in sequence. Discarding one card from his hand to the discard pile. Jokers may only be put down in escaleras, not in piernas. Not more than two Jokers can be included in one escalera. The play ends when one player gets rid of all their cards. This player normally scores nothing, and each of the other players scores penalty points for the cards remaining in their hands.